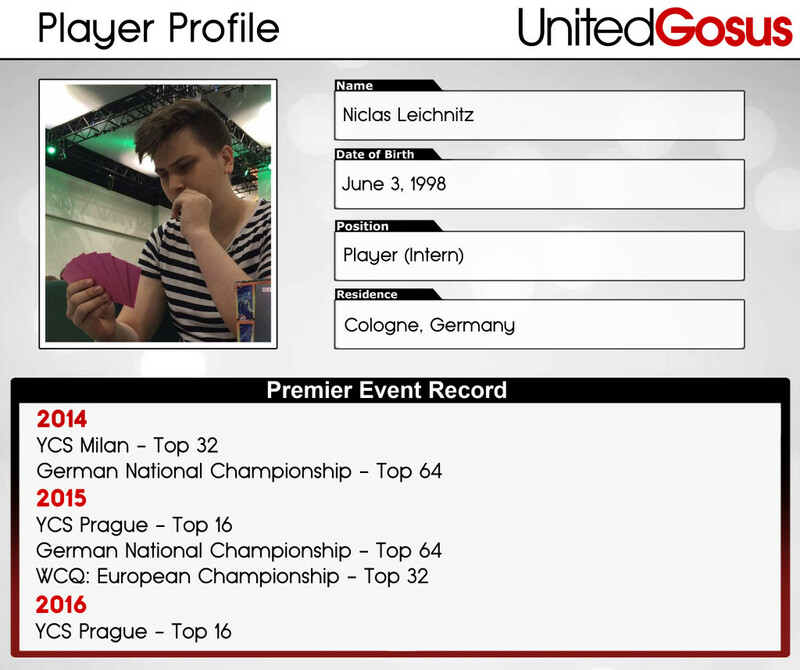 My name is Niclas Joshua Leichnitz, I’m currently 17 years old and live in Cologne, Germany. In a few weeks I will finish my middle school and after the summer I plan to study in the mercantile area. I got in touch with Yu-Gi-Oh! around 2004 when I got the Kaiba structure deck together with one of my friends. I chose the competitive way in 2014, which means consistent Yu-Gi-Oh! Championship Series (YCS) attendance and to compete in other major events. For me the game is more kind of a lifestyle. It enables you to travel around the world. Most people at my age aren’t able to do that. Furthermore you meet new people and improve your English. I started watching and playing Yu-Gi-Oh! with some kind of passion which doesn’t extinct yet. It’s for me just way more than a card game; it’s a big part of my life! If I prepare myself for an event, it’s more likely to meet up with some good friends! We will sit down, play some games and discuss about card choices and look at each other’s deck and help to improve. We will also analyze the current meta game and try to find unique tech cards or tech plays to get around commonly seen card choices or patterns in play. I joined United Gosus because it was a always a dream for me to be a part of it since the very beginning. It will help me to grow and evolve as a player and to get closer to my big goal: becoming the World Champion of Yu-Gi-Oh!